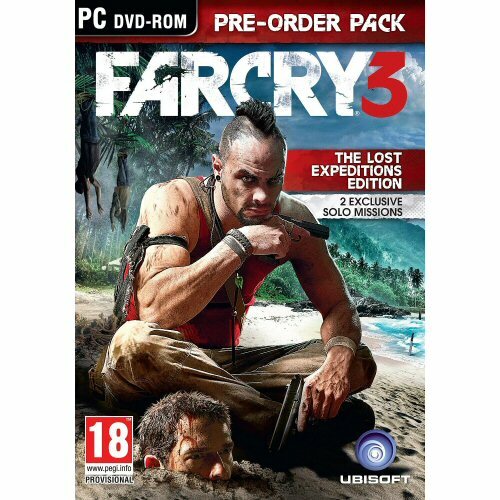 Buy Far Cry 3: The Lost Expeditions Edition for PC in India at the best price. Screenshots, videos, reviews available. Beyond the limits of civilization lies an island, a lawless place ruled by piracy and human misery, where your only escapes are drugs or the muzzle of a gun. This is where you find yourself, trapped in a place that’s forgotten right from wrong, a place that lives by the principles of violence. Discover the island’s bloody secrets and take the fight to the enemy; improvise and use your environment to survive. Beware the beauty and mystery of this unexplored paradise and live to outwit its roster of ruthless, desperate characters. You’ll need more than luck to survive. Encounter a diverse and realistic cast of characters as you dive into this deep and enriching story, where morals are questionable and hope is all but abandoned. Far Cry 3 is being developed by the world-class game designers who brought you such critically acclaimed titles as Assassin's Creed 2, Assassin's Creed Brotherhood, and World in Conflict. Discover the forgotten World War II ruins of the island in 2 exclusive extra missions. Find the way out to escape the research complex and the pirates standing between you and freedom. Blast away your opponents with immediate access to the Type 10, a modified single-handed destructive shotgun for multiplayer. Far Cry 3 takes you back to the lush green jungles after the sun baked Africa of Far Cry 2. Many people will welcome the return of tropical island atmosphere that made the original a big hit. The story is a nice - it could've been an excellent one albeit for some strange design choices. But the gameplay is the second best feature of the game, the best being the beautiful open world island you find yourself in. There are lots of side missions and activities to do and lots of stuff to collect. You can hunt wild animals and use their hide for upgrading and crafting different items. There are a lot of different types of weapons to collect too. If you are a completionist then it would take you a very long time to finish this game. Also there are the 'capturing the outpost' missions which are a lot of fun, but clearing an outpost could make the pirates on that part of island to go away. Now there is a patch that resets all the outposts (after capturing them all) so that you could capture them all again. The graphics of the game are so good that you will fall in love with the island. The voice acting and animations are top notch which compliments this game perfectly. You should definitely try this game for it will sure be an experience you'll never forget.